Mirrored bath accessories add sparkle wherever light catches them. Mirrors add light and space to any room, and their mirroring capability enhances and doubles your decorating value. Use mirrored bath accessories for bath decor in a powder room or guest bathroom, or treat yourself in the master bathroom. See also our other pretty decorative bath accessories and our useful mirrored vanity tray to complete your bathroom set. 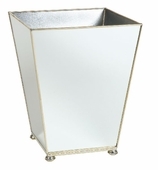 Note: the mirror in our mirrored wastebasket has an antiqued mirror look finish. Top (8 x 8 inches) bottom(6 x 6 inches) Height 10 inches. "Mirrors are marvels of space. They let you see a room twice. They stretch square footage, doubling the space and the light. They can act like another window or wall. A mirror at the end of a hall transforms it into a long, elegant gallery. Over a mantel, they become a painting of the entire room." Charlotte has all sorts of ideas for using mirrored bath accessories. For example, she suggests putting flowers in front of mirrors to make them seem more plentiful. It's a simple idea, but such a good one. Our mirrored bath accessories look wonderful with plants in front of them for example. Sometimes I will set Votives on the brackets--more opportunity for candlelight. In a master bedroom with a Georgian mantel, I wanted a mirror that was equally lighthearted. I found an artist who cuts, shapes, and paints copper, brass, and tole to form amazingly realistic flowers, insects, and leaves (complete with nibbled holes). We arranged the three-dimensional flowers on a simple white frame and hung it over the fireplace. The mirror looks dewy and fresh, as if we had brought a bit of the garden into the room. In another dining room, a mirror with antiqued glass creates quite a different effect. It feels much more mysterious. A mirror has a way of drawing you into what looks like another world, enticing you closer like a great conversationalist. A good mirror is a great investment. Every room can handle one." 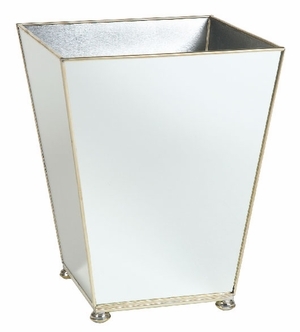 Mirrored wastebaskets and mirrored tissue box covers are a lovely way to get sparkle into any room, particularly a bathroom. As Charlotte would say, "every room can handle one." 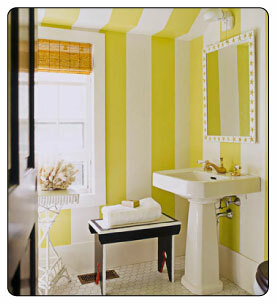 As we like to say, accenting is the first rule of bathroom decor. You already have a mirror above your sink, so adding a set of mirrored bath accessories like a mirrored wastebasket and tissue box and mirrored vanity tray to your bathroom will give you a reflective sparkle wherever your eyes roam. Bathrooms are generally not the largest rooms in the home, so adding mirrored bath accessories are a quick and simple way to give the appearance of extra space. It's a trick that you'll be glad to know for decorating. Mirrors are an elegant and versatile solution to decorating challenges, since they fit equally well with all decorating schemes. Mirrors have been a way to make us see ourselves in a good light, and this effect is one that fascinates us all, young and old people. Mirrored bath accessories are accents everyone can enjoy.